The $19 billion messenger app, WhatsApp, has a new update that includes an interesting way to get users to pay for the app service: by allowing friends to gift subscriptions to other friends. The new, Pay for a Friend, feature is as cheap as Facebook gifts, albeit with a more productive outcome. 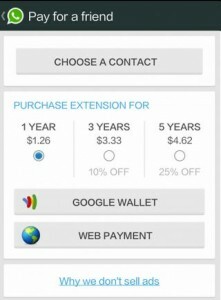 Subscription services and paid apps like these allow companies to provide better product that are free of ads. It’s privacy as commodity, and it’s becoming a new economy in the app world. Recent studies have shown that users are willing to pay as much $5.06 for personal privacy. At $0.99 per year, Whatsapp is a steal, practically. Users on the app may have noticed that even when they don’t pay, the app will continue working. So, technically, it’s $0.99 or less.